TRIVIA of Noh : Q41 : Is haori half-coat not used on the Noh stage? | Home | Trivia | Q41 : Is haori half-coat not used on the Noh stage? Is haori half-coat not used on the Noh stage? Noh is one of the traditional performing arts maintained in samurai communities, so all performers including musicians, assistants and singers wear kimono on stage. The scene of the performers in kimono lets us feel both dignified beauty and unusual strain. It also reminds us that a stage is a sacred place itself. Apart from costumed actors, performers wear kimono and hakama trousers, but they do not wear haori half-coat. Japanese people may think that they have to wear both haori and hakama when they are in full kimono dress. They may also think that performers are in informal dress because they are on stage. A full samurai dress consists of a crested kimono suite with hakama trousers. It was a ceremonial dress consisting of a kataginu (wide-shoulder sleeveless jacket) bearing their family crest, a kimono and a hakama (pleated trousers.) 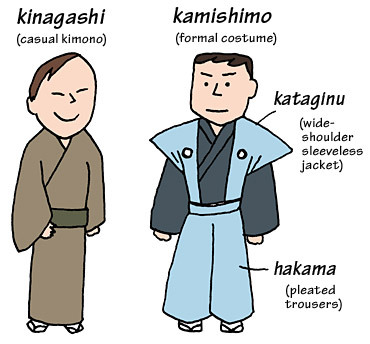 The style without a hakama is called “kinagashi” (casual kimono.) Common people did not have the custom of wearing hakama, so their formal style adopted haori to make it underdressed. In the Edo era, a Noh performer wore a kataginu and a hakama on stage. The current style may be a result of being simplified by removing kataginu. Actors in the present age sometimes wear a kataginu and a hakama for performances at theatre openings, celebrations, or memorial ceremonies.